Following his death in January 2018, the Sir Henry Brooke Essay Prize seeks to honour the legacy of Sir Henry Brooke, a former Court of Appeal judge who became a tireless campaigner during retirement on issues including access to justice. His post-judicial renown owed much to his enthusiastic adoption of digital technology; many came to know of him through his blog and tweets. He drafted significant sections of the Bach Commission’s final report on access to justice, and also acted as patron to a number of justice organisations including the Public Law Project, Harrow Law Centre and Prisoners Abroad. The Sir Henry Brooke Essay Prize is a scheme conceived by Young Legal Aid Lawyers (YLAL). We are grateful for the Public Law Project for its encouragement, and to our sponsor 39 Essex Chambers for its generous donation of prize money. Discuss, with examples, how technology can be used to advance access to justice in the UK. The competition is open to all current and prospective law students, paralegals, trainee solicitors and pupil barristers. You will still be eligible if you are currently between stages and intend ultimately to pursue a career in law. Entries should be a maximum of 1,500 words, including footnotes. Entries will be rejected if they do not address the subject of the title, or exceed 1,500 words. Please consult the pdf document below for essay conditions. Please note that we are happy to accept joint submissions co-authored by a maximum of two individuals. The winning essays will be chosen by a panel of distinguished judges. The judges’ decision will be final and no correspondence will be entered into. 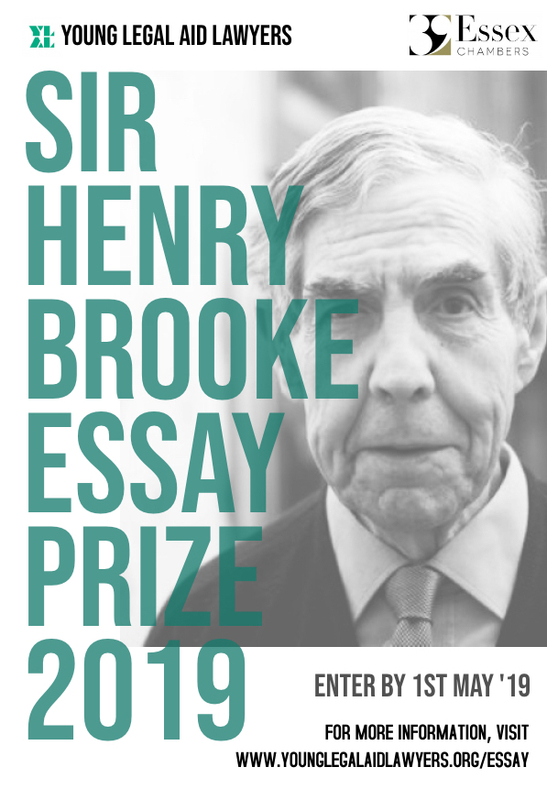 The winner of the Sir Henry Brooke Essay Prize 2019 will receive a £100 cash prize. The second-place winner will receive £50 and two runners-up will each receive £25 worth of book tokens. Winners will be announced at YLAL London’s July meeting and online, on YLAL’s website and through its social media channels. Essays must be submitted by 5pm on 1st May 2019 to SHBessayprize2019@gmail.com. Any questions should be addressed to SHBessayprize2019@gmail.com. For more essay competitions, check our page on scholarships and bursaries.